Mekedatu' means 'goat's leap' in Kannada. The name comes from an incident which is believed to have been witnessed by herdsmen in that area a long time ago. It is said that a goat being chased by a tiger made a desperate attempt to save its life by leaping from one side of the gorge and managed to cross over the raging river below, whereas the tiger did not attempt to replicate this feat, and abandoned the chase. 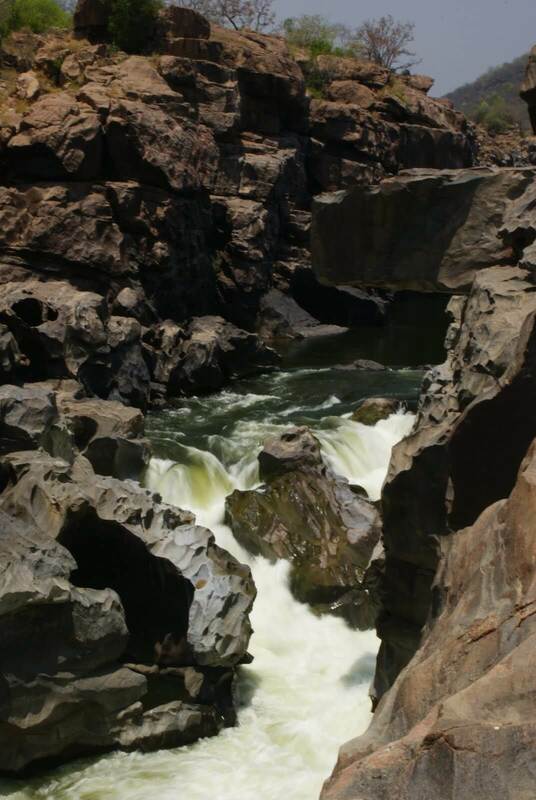 The point where the goat leapt has widened since then from erosion caused by the river Cauvery. It is about 100 km from Bengaluru via Kanakapura. 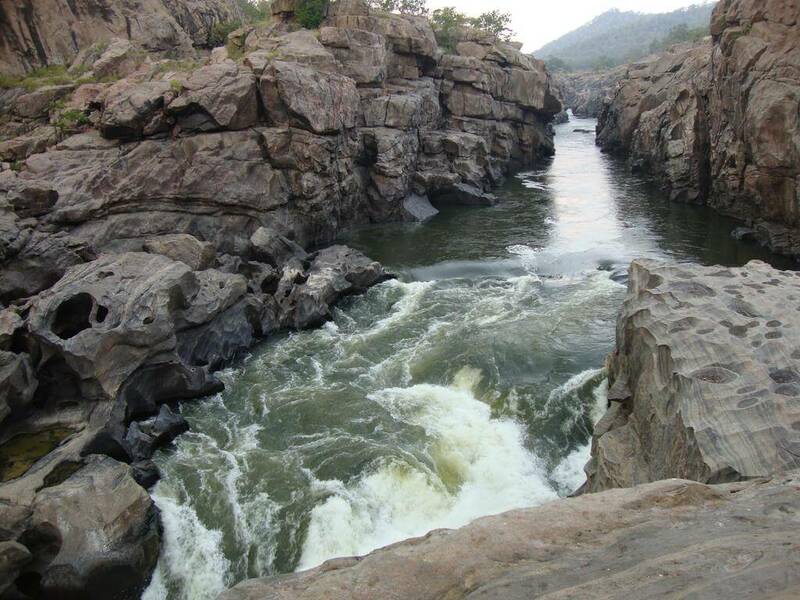 At Mekedaatu, the Kaveri runs through a deep, narrow ravine of hard granite rock. 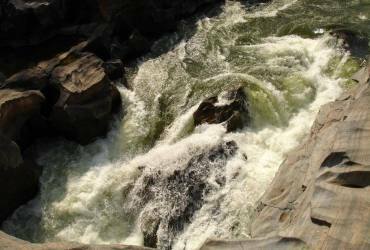 The river, which is more than 150 meters wide at the confluence (at Sangama) flows through the hardly 10-meter-wide gorge at Mekedatu. A lot of tourists visit this place, a high number of people drown in the river, either when swimming or slipping off the cliff. It is a very dangerous place. The 4 feet shallow water is very deceiving as it seems harmless but has claimed the life of hundreds of people in the past years. The water current is very fast, and a person can drown in minutes. Just a small slip might be fatal. There are also crocodiles in the water. The place lacks warning signs in several places, but crocodiles and slippery surfaces make it one of the riskiest tourist spots. 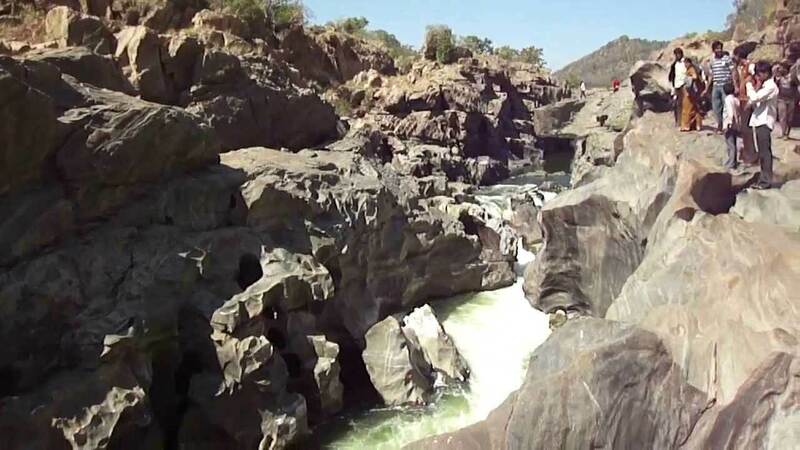 The rock surface near cliff, both during season or during dry season, is very slippery and deceiving. Usually young people and students, who venture near cliff drown here. From Bangalore there are many tour operators who provide transport to Sangama. From Kanakapura it is exactly 26 km. You have to drive more interior into the villages to reach this place. On the way there are boards showing directions to Mekedaatu and Sangama, both are the same, it is just that you have to reach Sangama to go Mekedaatu. You can also walk to Mekedaatu after getting off from the boat as it takes around 5 to 6 km to reach Mekedaatu from the Sangama if you don't want to board the bus. So if you have missed the Mekedaatu board you can reach by seeing this fishing camp board as well because this is also on the way.